One of my favorite parts when working on a piece, is adding the finishing touch, usually a pop of color. There are really three tried and true ways of adding color to a wood piece: painting, dying, and staining. Both painting and staining are chemical mediums which contain pieces of pigment that sit on top of the wood. Paint has large pieces of pigment, which, when applied generally totally obscure the wood grain, unless it is greatly thinned with a paint thinner such as mineral spirits. Stain is also a medium that contains pieces of pigment, but smaller pieces of pigment which will not totally obscure the grain. However, in both cases, paint and stain, the pigment is sitting on top of the wood, meaning with a bit of sanding it can be totally removed. With dye though, a chemical reaction is occurring between the dye and the fibers of the wood, completely altering the color of the top layer of the wood. You can still sand to remove the dye, but it will require a great deal of time and work to do so. The best part about the dye is because its not a pigment that sits on top of the wood, you can see the full grain of the wood, its color has just been changed. This blog post is the first in a series that will go through several different methods for dying wood. For method 1 I will be covering the use of FolkArt dye by PlaidCraft. You will want to make sure what ever wood project you are dying is sanded to 180 grit at a minimum, and 220 grit is preferable. FolkArt Dye is a water-based dye which will raise the grain of the wood after application. If you choose to add water to the dye to thin it a bit, which we will get to, it will raise the grain even more. Now, if you are going to add a top coat such as lacquer, I would not worry about the grain being raised. However, if you’re going to have no top coat, or you’re applying another water-based product as your top coat then it is best to use a damp cloth or a small spray bottle to get the wood slightly wet to raise the grain and sand it with 220 grit sand paper prior to applying the dye to avoid the dye raising the grain. Okay, now its time to prep the dye. You can get FolkArt dye in an array of different colors. All of them are pretty bold and bright. You may choose to take one of their colors and use-as-is. One of my favorites to use-as-is is the teal. You may also choose to do a little mixing of a couple or many of the colors to come up with your own hue. It is completely up to you. Either way, you will want to put your dye into one of your disposable cups. If you are mixing multiple colors together you will want to use a disposable stir stick. Now the next thing you need to determine is whether to thin it with water or not. If you apply as is, without thinning, you will absolutely still be able to see the grain of the wood. However, like I have stated, the colors are very bold, and because of that, they can distract from the grain pattern. So, if I have a piece of wood that has some very unique grain patterns, such as a piece of spalted wood, I usually decide to thin the dye down with water, just so the color adds to the pattern of the grain, not distract from it. To thin it, just add water to the dye in the cup and mix. Lay down a piece of cardboard on the table you will be using to dye your project. The piece should be big enough for the piece you are dying along with the cup of dye and the cotton rags. Place your piece of wood, your cup of dye, and your cotton rags on the cardboard. You will want at least two cotton rags. Put on a pair of Nitrile gloves to keep from dying your hands. With one cotton rag, dip it in the dye and apply it to your piece of wood. I like to apply the dye using a circular motion with the rag. Apply the dye to all surfaces of the wood you would like to color. 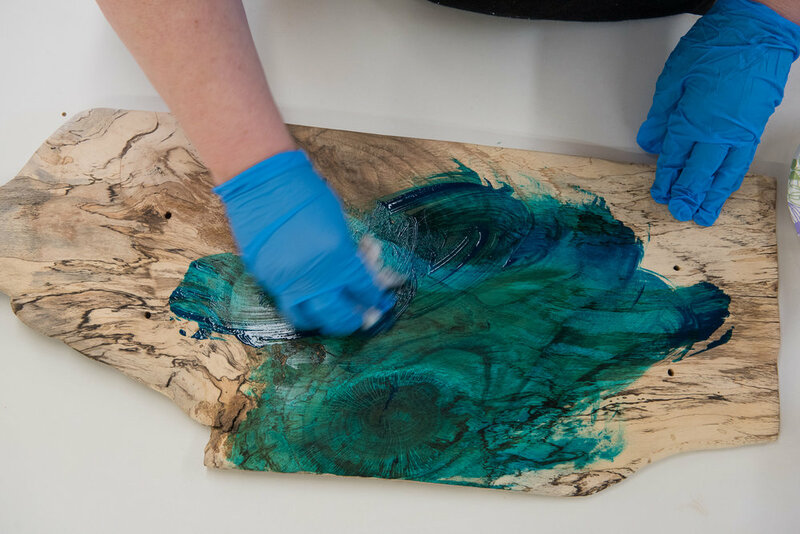 With the clean rag, remove any excess dye from the wood. Leave your wood piece on the cardboard to dry. Let the piece dry for at least two hours before applying any additional finish. Once the dye is dry, assess if you are happy with the shade of the color. If you want it darker, repeat step 4 and apply the dye again. If you are happy with it, move on to step 6. You will want to apply a top coat to your wood piece to protect the wood and to protect the color. I recommend using a top coat that is clear to allow the color to shine the most. I would also recommend either going with lacquer or a water-based top coat such as a water-based polyurethane. You can use an oil or oil-based top coat if you choose, however, oil tends to add a bit of yellow on top of the color. Also, because the dye is water-based, applying an oil-based finish on top can sometimes leave the finish looking a bit blotchy I have found. There are ways to fix this of course that I will cover in another blog. For now, if you stick with lacquer or a water-based finish you will be all good. 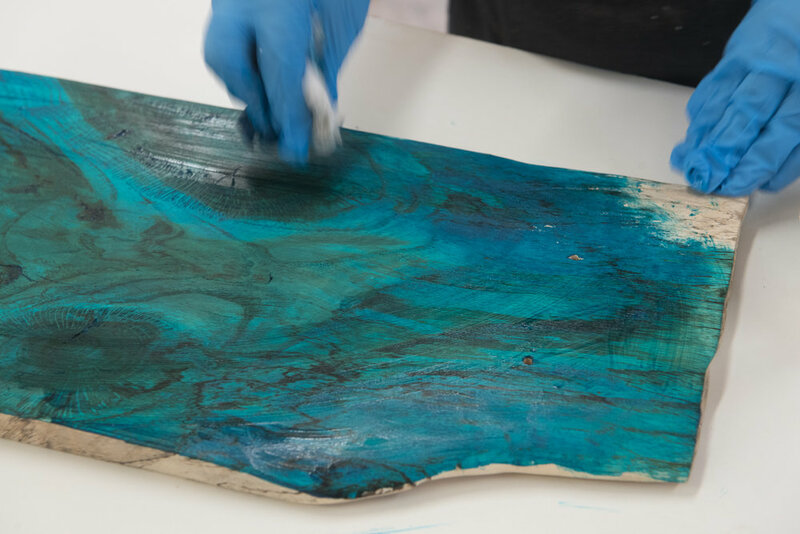 Below is a video of the full project of turning a piece of spalted oak into a turquoise serving tray with handles. Feel free to ask any questions about this method of dying in the comments below.